Most of the information here assumes some kind of knowledge already. I’m sorry about that for those who do not fully understand what I’ve written down. If you have any question, please don’t hesitate to ask me! It is mostly in negative chronological order: newest first! Most of this should be somewhere in my publications list too. 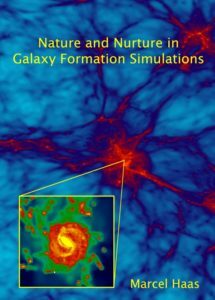 From the simulations described below, and work by others, insights have emerged about how galaxies form and evolve. The build-up of stellar mass inside them is regulated on the large scales, through a balance of inflow of gas (which is determined by the cosmology and the cooling properties of gas) and outflows (which are the result of massive stars and Active Galactic Nuclei). This implies that what happens deep inside the dense gaseous regions of the galaxy, including the star formation process itself (!) is to a large extent irrelevant for the star formation properties of the galaxy as a whole. There are some important implications of this picture. Even though self-regulation is becoming widely accepted, these implications are often overlooked. As such, observations and simulations are often interpreted erroneously. For now, just a link to the website corresponding to a paper. stars than you would guess from the (universal) mass distribution in the star clusters. The project for my PhD is part of the OverWhelmingly Large Simulations project. OWLS consists of a large suite of cosmological N-body/SPH simulations, using a modified version of Volker Springel’s Gadget code. The power of the projects lies in the large variation of subgrid models for the unresolved physics. For the non-experts: simulations have a limited mass resolution (and a limited spatial resolution). 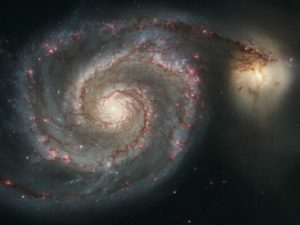 Therefore, many processes that are important in the formation of galaxies (e.g. forming stars, growing a supermassive black hole in the center, exploding supernovae, …) can not be followed explicitly. Therefore one makes assumptions about how these processes work out on the larger scales that can be resolved. These models are called subgrid models, and the most important aspect of OWLS is the large variation in these models. My project focused mainly on the galaxies that form inside a the simulation box, a beautiful example of which you see depicted above. 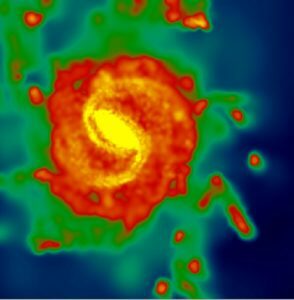 Selecting these galaxies automatically is not as trivial as it may seem, as a computer cannot look at such images as we can. A part of my topic is to select groups of particles that make up something together that an observer might call a galaxy. A comparison of several of these methods, from very easy (by linking particles that are close enough together), along physically motivated (group together gravitationally bound structures) all the way to creating mock observations of the simulation (and selecting galaxies with the tools observers would use for the same purpose) is an important part of my project. Getting observables (magnitude, color, reddening due to dust) for galaxies is also something of my concern. I implemented an adapted version of the Bruzual and Charlot (2003) population synthesis code to determine the luminosity of the stellar component of the simulated universe. This light then travels towards us and encounters gas and dust. What this gas and dust do to the light is vaguely known and I am now trying to consistently model effects, in order to come up with realistic luminosities and colors of the galaxies. The full thesis is here, too! sufficient to in detail derive ages, masses, extinctions and metallicity for all clusters separately. Therefore, it may be wise to only look at the statistics of the population, like radius distributions, luminosity functions and correlations between radius and magnitude (which both can be derived from the data, of course). So, that’s what we did and some rather nice results followed. In my fourth year I followed a course on General Relativity, of which this report on lensing by cosmic strings marked the end. The only course more or less related to my later work was about galaxies. A report on synthetic spectral modeling of galaxies resulted from this. The course on stellar mass loss culminated in an abstract about the research of the influence of stellar mass loss on the evolution of star clusters. I also did a small research project in Solar Physics. I went to La Palma, to the Dutch Open Telescope for that. A small report on my ‘findings’ can be found here. A report on the calculation of the velocity distribution of particles in gasses at extremely high temperatures, which I’ve written during my third year. 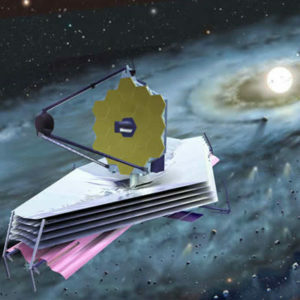 A report on the analysis of the X-ray spectrum of an AGN, using SPEX. Also third year stuff. A text on the numerical integration of partial differential equations from my second year. A text on some methods used in observational astrophysics, belonging to the corresponding second year course.